It must have seemed too good to be true. A literally captive labour market, generous subsidies and tax concessions, and a government that steadily delivers a resource rendered powerless by threat of destitution and homelessness, and who have little or no recourse to appeal against their fate -profit guaranteed. There was a brief moment of hope for the unemployed when Kevin Rudd and the Labor party were elected in 2007. Following a decade of sufferance under the Job Network system, it was expected that the new government would sweep away the hated, exploitative punishment regime introduced by the Howard government in 1998 and overseen by then junior minister for Employment and Youth Affairs, Anthony John Abbott. Those hopes were quickly dashed when Rudd studiously ignored the need to redress unemployment. It was quickly recognised by those at the receiving end of the system that there would be little if any change. Nor was it any real surprise. Rudd’s partner, Therese Rein had become a millionaire as the CEO of Ingeus which was sold for a cool $222 million to the US based Providence Service Corporation from which she pocketed a paltry $15 million. Things didn’t change with Gillard at the helm. In fact, things went backwards. Gillard refused point blank to even consider raising welfare payments to $400pw and mouthed the same platitudes normally expected to be heard from the centre Right of the Coaliton. The Newstart payment was there to give people the incentive to look for a job and not for them to rely on as a source on income, and should anyone tempted to choose unemployment as a life-style choice, Gillard bolstered her argument by making an example a particularly vulnerable sector of welfare recipients; single mothers with children over the age of eight, and shifting them from single parenting payment to Newstart and effectively cutting their payments by between $60-160 per fortnight. The minister of the day, Jenny Macklin whose tenure in parliament is singularly identified by its perpetual lack of motion, claimed the move would help single mothers into the workforce, and threw in the usual homilies of saving the taxpayer money to complete the lie. Unsurprisingly, Macklin announced today that Labor would “consider its options” on a cashless welfare payment card. Here’s your Twiggy card. Don’t leave home without it! Those who have no choice save to exist on a few drops from the public teat are chastised and told in a firm tone that it must be used sparingly, while those who are the public teat, gorge themselves on its largesse and preach austerity. An embarrassing and steady rise in unemployment and the rush to the trough by not-for-profit and corporately owned service providers to cash in on it for one thing. According to the ABS, there are officially 800,700 people unemployed and another 1,046,500 under employed. 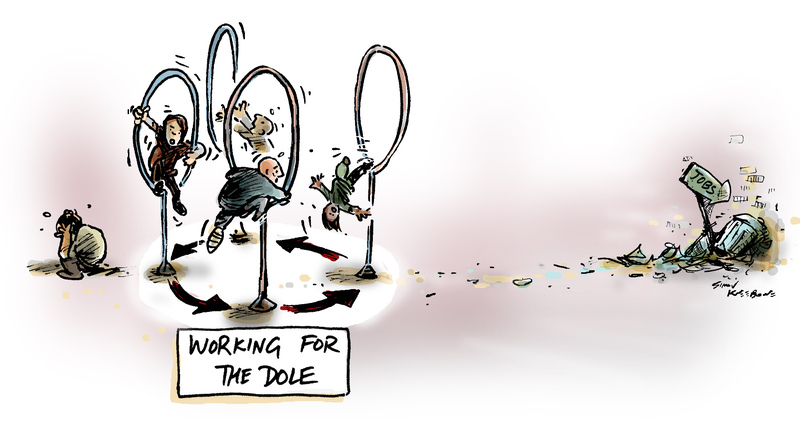 In their haste to reap the benefits from the Jobactive scheme, the agencies overlooked the mire of logistics involved to actually place every Newstart recipient between 18-65 in either a WFD placement or doing ‘voluntary’ work. The result has been chaotic since the scheme began in July. To comply with the government’s terms of contract, providers had to have all Newstart recipients signed up by the middle of August and now, less than two months later, inside sources are saying that the system is already on the brink of collapse. Newton observed that for every action, there is an equal and opposite reaction. The opposite reaction among the unemployed has been a steadily growing anger at the Coalition’s failure to create jobs, while at the same time cudgelling those who have fallen victim to its policies of down-sizing, out-sourcing, and cut backs in every sector, then telling them to look harder for jobs which don’t exist. The scheme, similarly to previous WFD schemes is doomed to failure. Despite its carefully ambiguous statements of ‘outcomes’, the tasks are little more than what once was known as ‘occupational therapy’ and was restricted to patients who needed less Thorazine than those in the lock-down ward. It offers nothing in the way of genuine re-training or imparting real skills, and at its very best, can only offer the participant Aspirare esse sub erogatis; a chance to aspire to under-employment. What it does offer however, is 800,700 unemployed and 1,046,500 under-employed the opportunity to make up a powerful voting bloc, and to express their anger through the ballot box.